Our attitudes and behavior reflect the fact that we are standing in the presence of God within His Holy Sanctuary. By our actions we will show ourselves to be prayerful and reverent, and also we will always pay attention to what is taking place around us. When we are asked to serve, we will arrive properly dressed at least 10 minutes before the service. Remember that we serve as examples to the other young people in our church community. The Sanctuary will be kept clean and neat at all times. Acolytes are responsible for maintaining its cleanliness as well as the neatness of the robes and other items used in the processions (i.e. we remove wax from candle holders and/or clean the fans and cross). We also keep the counter clean after cutting the antidoron (bread), and put everything back into its proper place. 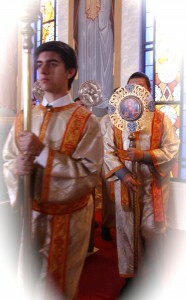 As Acolytes, we prepare ourselves to receive the Body and Blood of the Lord Jesus as often as possible. We fast on the appropriate days (i.e. Wednesdays and Fridays and throughout other fast periods) as well as by limiting our thoughts, words, and actions to those things that glorify God. When we make the sign of the cross we reaffirm our identity as Christians. 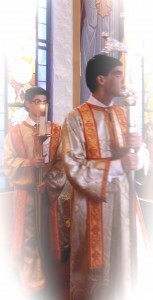 When we serve as Acolytes, we show our reverence to the Lord by crossing ourselves at the moment we enter the Sanctuary, walk behind the Altar table, observe Father crossing himself, or whenever the Holy Trinity is commemorated during Divine Services. Acolytes, just as all Christians, participate in Holy Confession during the Advent Fast and during the Great Lenten Fast, at least. This is part of our preparation for serving and celebrating throughout the Church year. Acolytes respect the concerns and directions of the Parish Priests / Leader.